Pollen House was originally built in an area known for its tailors, and is today renowned for its many commercial art galleries, sitting close to the Royal Academy and surrounded by the likes of Burlington Arcade. The minimal frames with flush hinges and locks provide clean lines which complements the new interiors. A high specification design created an attractive environment, though significant attention to the existing steel windows was needed however in order to minimise the problem of traffic noise. Noise reducation of about 45dB was achieved through treating each window with a single hinged casement, glazed with 6.8mm acoustic laminated glass. The minimal frames with flush hinges and locks provide clean lines which complement the existing windows and the new interiors. 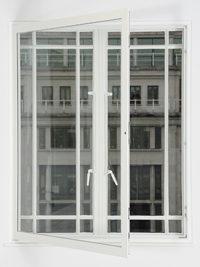 In addition, the secondary glazing reduces heat loss by approximately half, and almost eliminates draughts to ensure a comfortable working environment.